Via an email to her supporters, Hillary Clinton's 2016 presidential campaign just kicked off. Hillz, who is widely regarded as the Democratic front-runner, will now head out to Iowa to really get her second campaign started. And boy, the dream of Clinton becoming president is starting to feel a little closer to reality. 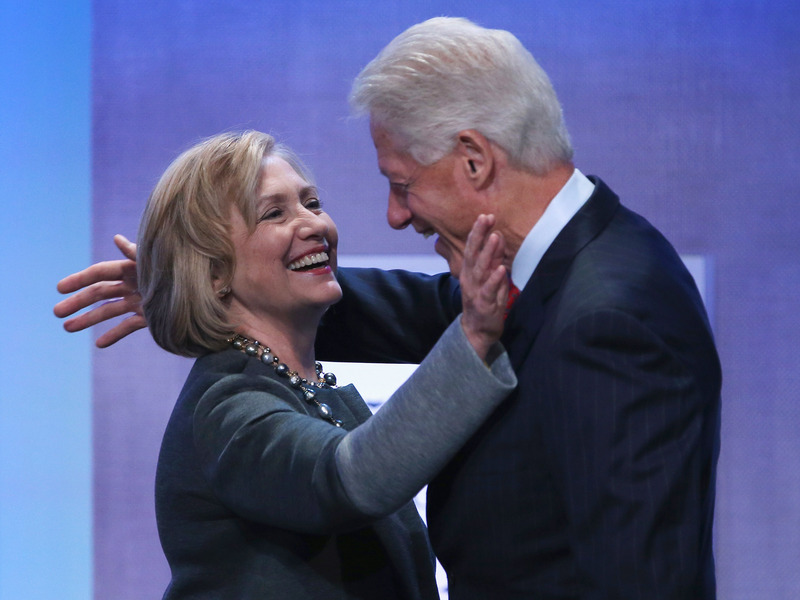 But if Clinton really does end up as HBIC, what will Bill Clinton's title be? Not only is this uncharted territory, but we also have to take into account that Bill, too, was once president. Once a president leaves office, it is proper etiquette to still refer to them as president. So that means technically Hill and Bill could have Mr. And Mrs. President as their official title. Other countries light years ahead of us have already elected women to top jobs, so maybe we should take notes from them. In Germany, Joachim Sauer is simply referred to as Chancellor Angela Merkel's husband. She's the most powerful woman in the world, and, yup, he's her husband. In the Philippines, male spouses are called First Gentlemen. And in Argentina, the press has dubbed President Cristina Fernandez de Kirchner and husband Nestor the "presidential couple." Even though he was president himself, Nestor Kirchner is also referred to as the First Gentleman of Argentina. I did some digging and apparently it is customary in the United States to call the male spouse of a female politician First Gentleman. But who says Bill can't come up with his own title? Todd Palin, husband of Sarah Palin, preferred to call himself "first dude" which is probably the first and last good political move those two have made. Okay, I didn't actually come up with this one because the US has already crossed this bridge — kinda. Way, way back in 1964 Polly Bergen starred in Kisses For My President and her hubby became the first male "first lady". Take that, patriarchy. I sort of just wanted to put a cape on Bill, so that's my main reasoning for this one. We actually can't rule out the fact that Bill could play an actual role in Hillary's presidency. His resume is pretty legit for the job.